It’s sad to say how much I took avocados for granted when living in California. They were great, tasty, cheap, and plentiful. Just add a bit of avocado to pretty much any main dish and you have an automatic hit. Or even just smearing some on some whole wheat toast with some salt and pepper is enough for satisfying snack. Heck, I can remember my dad taking a spoon and just eating them directly, scooping big hunks of green from the tough peel. Which means that when I see the local Costco has a grip of avocado delivered as fresh produce? Oh, yeah. I’m all over that. Buy goodness in bulk, my friends. 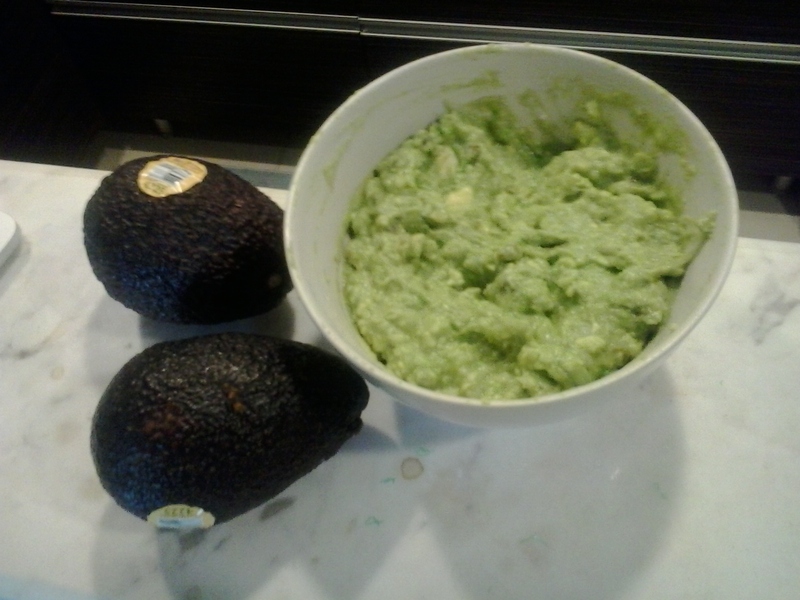 Now, with all these extra avocados, and just in time for your Oscar night party, why not make some guacamole? Step Two: Mash everything together. If you can, let it rest for half an hour or so, to let the flavors meld as much as possible. It’s lucky if it can stay that long, of course! Some tricks, here: Keep air from getting exposed and causing browning. So cover with plastic wrap, and by that I mean use a spatula to create a smooth surface and tap the plastic wrap to the surface of the guacamole. Also, you can put into plastic ziploc bags and fold the tops back before you zip them close, keeping as much air out as you can. This entry was posted in Food and tagged avocados, guacamole, recipes. Bookmark the permalink.